I’ve now used Disco for about 3 burns (more than I’ve done in my whole first year as a Mac user) and so far I really like it. It’s simply a nice and task specific application with drag’n drop. Just the kind of application I like the most. For the most part, you wouldn’t notice that Disco has just entered the public beta phase. But there are a few places where it’s more than obvious. For example, there is no help system, no scripting support and when it comes to file management before hitting the “Burn” button there are also a few things missing. I want to be able to choose, how files are stored in the “Burn files” window. Currently the ordering seems to be random (meaning not really transparent). Esp. when you’re archiving an ordered list of files and notice, that the disc will get slightly too full, it’s hard to find the “last” file. Indexing ISO images would be nice. 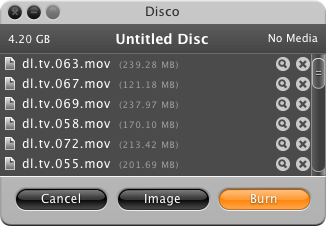 While Disco supports spanning too large file collections onto multiple discs, breaking up one single file would be nice too (I just heard that this feature is missing. Haven’t tried it yet.). While a help system, some tooltips to some of the preferences would suffice for no IMO. I esp. hope, that #1 is implemented soon :-) But apart from these few points, I’m really happy with Disco.app so far. Great work.